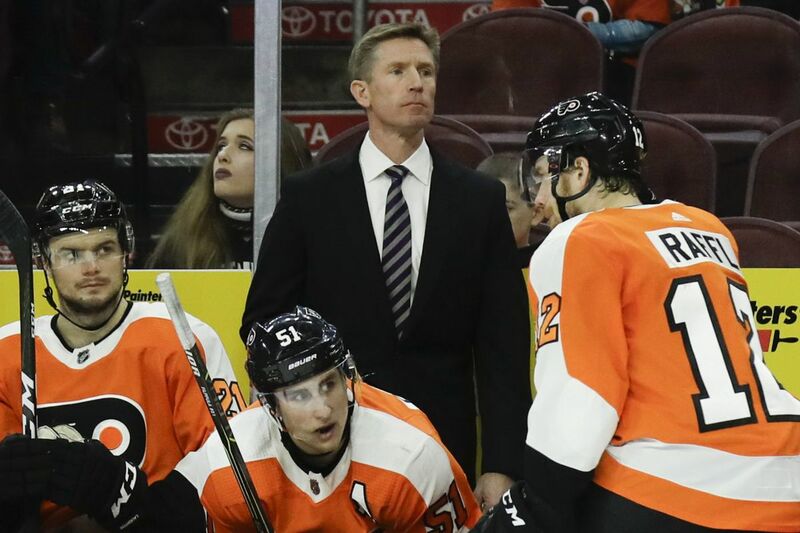 Dave Hakstol was fired by the Flyers on Monday. That’s what became painfully apparent during the Flyers' most recent stretch of erratic, inconsistent, confused — there are just so many unflattering adjectives — play. Coach Dave Hakstol lost his players, they lost him, and all the positive talk of fixing little things and playing more consistently rang as hollow to them as it did to the fans who heard it repeatedly. After Saturday’s 5-1 loss in Vancouver, players were asked, practically begged, to say it wasn’t their coach’s fault. They deferred. The fix will happen without Hakstol, who was fired before Monday’s practice, which was run by assistant Kris Knoblauch, a former highly successful juniors coach in Erie. What is clear is that Hakstol’s message had worn thin, and really never wore very well to begin with. His team’s successes over his three-plus seasons here were always pockmarked by big pockets of inconsistencies, forcing a frantic push to try to make it into the postseason. Sometimes, it worked other times it didn’t; when he met the press after a 4-1 loss in Edmonton on Friday, Jake Voracek sounded like a man who had enough. "It’s tiring always having to say we didn’t play that bad but we deserved better," he said. "At the end of the game, it doesn’t matter. You just have to win the games." And finally, here is the captain, Claude Giroux, when an Edmonton reporter attempted to draw a parallel between the coaching switch the Oilers made and the change in general managers made by the Flyers. "I think it’s a little different," Giroux said. "When a coach gets let go, new guy comes in, wants obviously to change a little bit ... system-wise and on the ice. But when you get a new GM, nothing really changes. How we get ready, our game plan, how we get ready for the game. All that kind of stuff, it kind of stays the same." The sameness of it, and the sameness of the result, left these Flyers playing as if they had just met on a pond. On Saturday Weal inexplicably interfered with his own defenseman, Shayne Gostisbehere, as he attempted to challenge a shot on net. Another goal was scored when a Canucks defenseman without a goal all season skated through four of the five Flyers on the ice. While Hakstol’s fate seemed sealed by the Flyers disastrous road trip, there was an oddity and awkwardness to Monday’s proceedings. According to sources inside the organization, Hakstol asked Fletcher to tell the team that he would be their coach for the remainder of the season Monday morning in order to quell the firestorm of reports and rumors circulating -- including one that had Joel Quenneville accepting the Flyers coaching position. Fletcher would not, said the source, and instead fired Hakstol. That led to a wild series of events that began with assistant Kris Knoblauch running practice and ended with both Gordon and his goalie, touted prospect Carter Hart, headed down the Northeast Extension. As for Quenneville, Fletcher insisted he had neither spoken with him nor asked the Blackhawks for permission to. Fired by Chicago last month, Quenneville has a year remaining on a contract that pays him $6 million annually. He has reportedly told people he does not want to return to coaching until at least after the holidays. On the job for just two weeks, Fletcher had spoken too of waiting until at least then to assess things, telling me just a week ago that he did want to enter this job with "guns a-blazing.'' He also thought, before Anthony Stolarz became the latest Flyers goaltender to go down, that he could wait for goalie-of-the-future Carter Hart to get more seasoning. Instead Hart discovered Monday what Hakstol discovered Monday and what Ron Hextall discovered two weeks before. Lose enough, and the future comes more quickly than you want it to.